After several years of fiscal progress, the federal budget deficit picture has worsened, according to a recent report from the Congressional Budget Office (CBO). 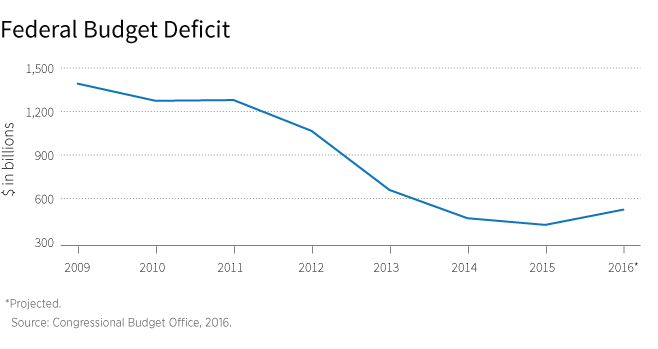 For the first time since 2009, the annual deficit is projected to increase, in relation to the size of the economy, in 2016. The budget deficit projected by the CBO is $130 billion more than the August 2015 projection of $426 billion. Why did the budget deficit projection increase? Federal revenues are expected to rise by only 4% in 2016, with CBO projections indicating expenditures will outpace revenue for the next decade. Even with the current economic growth, federal revenues will not keep pace with spending. At the same time, today’s average effective tax rates are significantly lower than 50 years ago. If no legislative changes are enacted, the budget deficit will continue to grow over the next 10 years and drive up the debt held by the public to 86% of GDP by 2026, up from the current debt-to-GDP ratio of 76%. The main drivers of this projected increase are higher interest rates and increased spending for Medicare and Social Security as more baby boomers retire. As a result of these fiscal pressures, individuals planning for retirement should prepare for the potential of higher income taxes and reduced benefits in the future. In fact, according to CBO projections, Social Security’s trust funds will be exhausted in 2029. At that time, the result would be a 29% reduction in benefits.